Birthing From Within offers a special kind of childbirth support. Parents and professionals worldwide seek out Birthing From Within classes and workshops because they understand that our approach to the childbearing years is absolutely unique. Birthing From Within is for you if you want childbirth education classes that are more than just risks-and-benefits, labor positions, and breathing techniques; doula care that's more than just encouraging words, hip squeezes, and "informational support"; or postpartum processing that's more than just rehashing of trauma. We recognize that birth is not only a set of medical events. Every birth - whether medicated or unmedicated, vaginal or cesarean - is an epic, transformative journey, a gateway to an entirely different life. Birthing From Within honors the intensity of this journey with creative, heart-centered support that combines scientific understandings with ancient inner knowing. 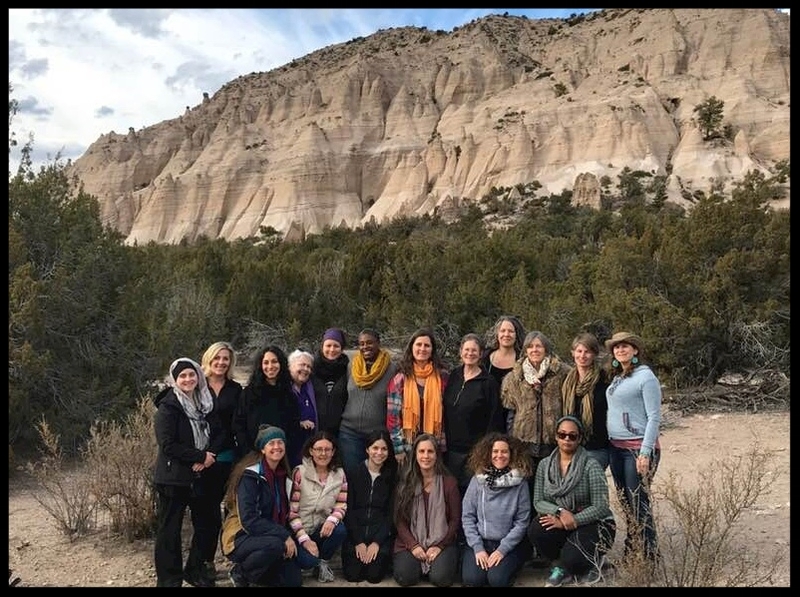 Birthing From Within founder Pam England (second row, third from right) with the Birthing From Within leadership and professional training team. Birthing From Within envisions that as the world remembers that birth is a heroic journey, the ancient maps for modern birth are thus unearthed. Birth trauma can be prevented and healed. Childbirth preparation requires more than data downloads and mastering techniques. Doula care involves more than hands-on support and cheerleading. Ritual, ceremony, and art processes are key components to unearthing the ancient, inner knowing within us. It is this knowing that makes us capable of completing the heroic journey that makes up the childbearing year. Parents need a village surrounding them as they embark on their journey. Birth is a rite of passage regardless of how it unfolds. Being solution-focused is more effective in preventing trauma than being outcome-focused. Inspire personal transformation and create new lenses through which parents and professionals can see themselves and others. Continually imagine new boundaries, processes, and solutions in our programs. Actively welcome and embrace all people to our community. Foster a deeper understanding of the physiology of birth. Reveal the wisdom of the ancient maps for the childbearing years. Bridge modern science with ancient knowledge without a focus on one over the other.